Surprised? People with a strategy perform better. Nutrition on long days. 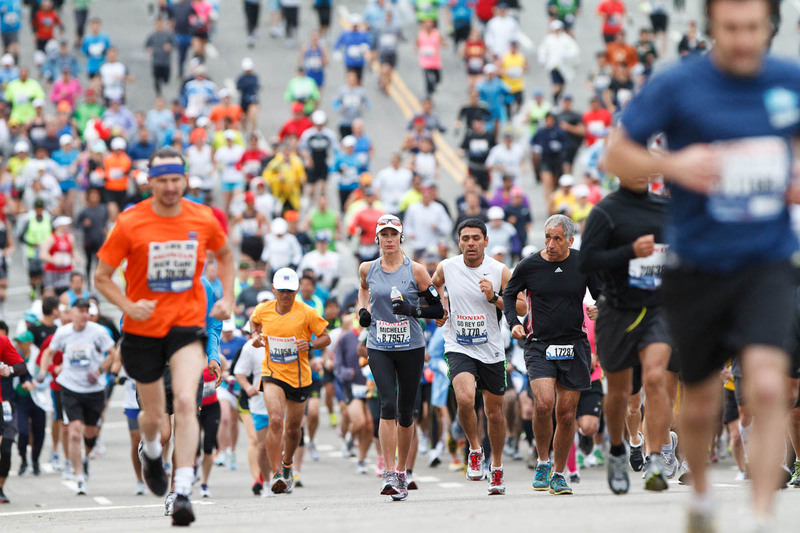 In a real world experiment, marathoners with specific fueling plan ran 11-minutes faster. The annals of fluid- and carb-taking research are overflowing with laboratory studies, i.e., runners on a treadmill. These studies almost always show that endurance athletes perform better when they drink something and consume some carbs. In the lab. On the treadmill. Far fewer studies are done outside the lab, where the random weirdness of real-life running can prove, well, random and weird. What’s more, real-world studies don’t always replicate the lab experiments. This really shouldn’t be surprising, but for a lot of us, it is. A lot of people even in ultras will use an “eat when hungry” and “drink when thirsty” strategy. I’m not saying that can’t work, but most people probably won’t get the most of their bodies during racing when doing that. Your body is a machine, and when you’re trying to get the most of that machine, you need to fuel it. Every single event I’ve ever hit a wall in or cramped in has been one where I just winged my nutrition and hydration. Every single event I’ve stuck to a specific nutrition plan in, I’ve felt pretty fresh at the end. Take the Peak Races Ultra as an example. I was testing out a nutrition plan of getting 300 calories per hour after the first hour. I took a GU with a sip of Osmo-infused water on the :15 and :45 minute marks of every hour, a Honey Stinger Waffle and a sip of Gatorade on the :30 minute mark, and then a big slug of Osmo-infused water at the start of every hour. I felt great when I crossed the finish line. True that was partly due to pacing, but I never experienced a bonk or cramp in 9 hours. Obviously the strategy differs depending on the length of the event. You use your body’s stored fuel reserves up until around the 90 minute mark in exercise. The further out from that 90 minutes you go, the more dialed in your plan needs to be and the earlier you need to start fueling. This goes outside of racing too. Summit days on big mountains are typically 12 hours minimum, and a lot of people are hammered by that. The freezing temps make it harder to eat and hydrate, but implementing a solid fueling plan can make summit day less of a sufferfest. Most people will get by with 200-400 calories per hour. I like to do a mix of gels and solid food. I feel the gels alone just pile in my gut without the solid food there to break it up. Gels and the like may not seem appealing in mass quantities, but they are easy to carry and dose. I’ve played around with things like chocolate covered espresso beans, wasabi peas, iskiate, and pinole. They are harder to process and more bulky to carry due to them not being as calorie dense. On a long hike or mountain run, I prefer to add these in there though. Experiment with what you can tolerate in training, and try a nutrition strategy for your next race. You may be surprised at the results.